So, we're stretching the definition of "film" today, but just a little bit. 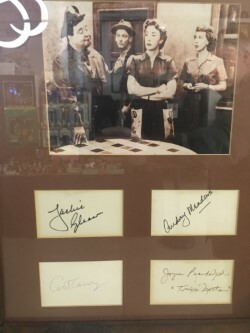 We're calling out our collage of autographs connected to the timeless television show "The Honeymooners," which was, at different times, performed in front of a live studio audience AND filmed for television. The four actors whose signatures complement our framed image from the show are of the longest-standing actors in the program: 1). Jackie Gleason, who played the gruff and loud Ralph Kramden, 2). Audrey Meadows, who played his long-suffering wife Alice in all but the first nine sketches for the show, 3). Art Carney, whose Ed Norton lived in the large shadow of his abusive friend, and 4). Ed's wife Trixie, most closely associated with the actress Joyce Randolph. The show first aired in 1951 as a six-minute sketch on the Jackie Gleason-hosted television program Cavalcade of Stars on the DuMont Broadcasting Network. Inspired by the radio show The Bickersons, the sketch depicted working-class life in Brooklyn. It became a hit and moved to CBS the next year. Although numerous short sketches and half-hour programs were recorded of The Honeymooners, the "Classic 39" episodes that ran from 1955 to the next year are considered the peak of the show's production. There's lots of verbal abuse in the show, but an underlying sense of affection between the characters. It may not be for everyone, but our signed image still captures a special time in American television history.